There were some good questions and interesting comments on my Cotton Spinning Update post, so I thought I would expand a little on the subject. Do you card it into rolags before you spin it? Yes. Actually, I've been carding them into mini-rolags called punis (also spelled poonis). A "how to" along with a little more information about cotton lint can be found here. It's wonderfully soft! Not silky, though it does have a little bit of luster (at least it seems to when I try to take a flash shot!) The yarn has a lovely next-to-the-skin wearable softness to it. That's a good question. Since cotton is not in the least bit elastic, I am tending to not want to use it for a knitted project. I am, however, thinking about weaving a scarf. This is a bit daring for me as I rarely weave with my handspun. I will have a whole rainbow of colors when I finish spinning it all (pix of all those here). Now that the Olympics is over, I amuse myself as I spin by thinking of how to use the colors to advantage. More on that later. Along with Tina's questions I'd like to know how strong the yarn is. The 2-ply is wonderfully strong. It will be good as both warp and weft. I did however, have some too thin spots in the singles of the first skein, which led to some breakage when I plyed it. I've pretty much corrected that, though this is one of the problems I seem to have spinning long draw. I love spinning long draw for the exact reason that it is so much quicker than short draw (inch worm method). 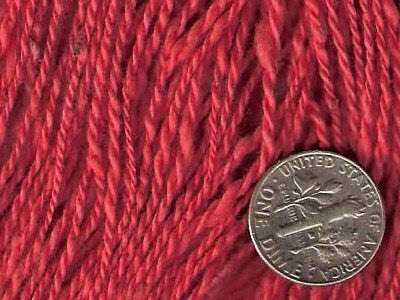 For me however, it does make a somewhat inconsistent yarn, as you can see in the close-up below. This is partly due to preparation. The cotton lint tends to be clumpy, especially after being dyed. It also still has some bits of husk in it. Between that and the fact that my long draw spinning is somewhat slubby anyway, well, you can see the result. Many of the slubs can be individually pulled out during spinning, others I roll down. According to my Judith MacKenzie Mc Cuin video (Spinning Exotic Fibers & Novelty Yarns), these slubs even out during plying. I find though, that often they ply together which intensifies them. The same goes for the thin areas. Even so I'm not unhappy with it. The singles average 42 WPI and the 2-ply, 22 WPI. I'm using my smallest spinning ratio (16:1), as cotton requires a lot of twist. For cotton, I keep the tension tight enough to draw in, but loose enough so that if I stop spinning, I can pull the single from bobbin without breaking it. So to Dorothy and Jewel, I say jump on in, the water's fine. :) It takes a little practice to get it started, but cotton is lovely to spin. I've never seen anything like your cotton yarns. Thanks for the Q&A session! Leigh, I seem to have the same problem that thick plies with thick:) but when I tried to spin my cotton very fine and even - it turned out to be quite hard and not as nice to the touch! so I decided that I am not a machine and I'd rather wear nice and soft cotton with little slubs than perfectly spun stuff - that's scratchy! I do use it for knitting though - if you choose patterns without ribs etc. - it's perfect for summer knits! I like patterns like simple t-shirts etc. - very nice to wear - though you wouldn't get very far with the small amounts in one colour. I am looking forward to any of your ideas! Bettina, thanks for the tip on choosing knitting patterns for cotton yarns. I won't rule out a knitted project entirely. As to the barcodes, who knows!?!?! Computer codes never seem to make sense! You do such beautiful work! I'm green with envy! Bummer about your content getting stolen though - I've bookmarked the copyright site for future reference as I'd like to add a couple of patterns to my blog and would sure hate for someone to steal them and call them their own! Thanks for taking the time to answer all our questions. I might give it a try again. Thanks for the Q&A. I have problems with the consistency in thickness when I do long draw, which is why I reserve it for when I want to do a slubby yarn. I meant the "speechless" as in great awe and reverence for your work, Leigh! I have never liked to spin cotton...but, seeing this inspries me to try it again. Thanks for being a good sport about my teasing Kathy. *grin* Sharon too. I really appreciate that you read and take time to comment. Thanks for answering my "20 questions" :-) Very cool - T.